#810 5¢ Monroe, "bright blue" shade. #1040 7¢ Woodrow Wilson, dark rose carmine shade. #681 2¢ Ohio River, carmine rose shade. #1292a 40¢ Paine, tagged, bluish black shade. #2616 29¢ World Columbian Stamp Expo, unlisted broken "a" in "May, the 2nd and 4th stamps in the block, as described in Linn's. #680 2¢ Fallen Timbers, deep carmine roseor lake shade. #UX40 2¢ on 1¢ Franklin, UX28 surcharged by canceling machine in light green. #C39b 6¢ DC-4 Skymaster, dry printing. #1582 2¢ Americana dull gum, on greenish paper. #1293a 50¢ Lucy Stone, tagged, deep rose magenta shade. #1035 3¢ Statue of Liberty, dry printing. #2132b 12¢ Stanley Steamer precancel, gray blue shade, "B" press. #2252a 3¢ Conestoga Wagon, claret, shiny gum, not tagged, on bleached white paper. #827 22¢ Cleveland, vermillion shade. #1289b 20¢ Marshall, tagged, dull gum, black olive. #806 2¢ John Adams, rose carmine shade. #1305E 15¢ Holmes coil single, type I, magenta. #C36 25¢ San Francisco, wet printing. #850 2¢ John Adams, rose carmine shade. #E5a 10¢ Messenger Running, dots in curved frame above messenger, pl. 882. #1294a $1 O'Neill, tagged, purple shade. 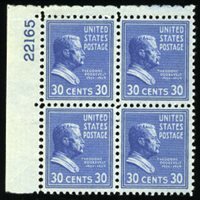 #830a 30¢ Theodore Roosevelt, blue shade, according to 2000 PF certificate. #569 30¢ American Buffalo, double transfer, 16065 UR 52.